Brace yourself for flavour galore. It can be consumed daily owing to its premium quality ingredients. 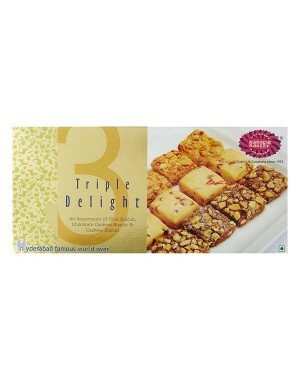 Combination of Fruits Biscuits, Cashew Biscuits and Choco-cashew Biscuits. Shelf life of product is 2 months. A staggering chronicle of six decades and still going strong, Karachi Bakery has emerged as a "True Icon of Hyderabad Baking" with a reputation that is unmatched to the core. Always a step ahead of competition, we focus on innovation, developing new products while improving our existing products to evolving consumer needs. A subtle combination of traditions and trends, our extensive collection of greatly appetizing baked goods and confections delights the senses of all age groups and people from different walks of life. The secret of our excellence lies in the meticulous care and detailed craft that goes into each and every one of our products. It is this sustained commitment to excellence backed by a world class production and distribution network and customer friendly service that has enabled us to carve a niche for ourselves across the length and breadth of India. Today, Karachi Bakery is a household name in every nook and corner of the globe.A staggering chronicle of six decades and still going strong, Karachi Bakery has emerged as a "True Icon of Hyderabad Baking" with a reputation that is unmatched to the core. Always a step ahead of competition, we focus on innovation, developing new products while improving our existing products to evolving consumer needs. A subtle combination of traditions and trends, our extensive collection of greatly appetizing baked goods and confections delights the senses of all age groups and people from different walks of life. The secret of our excellence lies in the meticulous care and detailed craft that goes into each and every one of our products. It is this sustained commitment to excellence backed by a world class production and distribution network and customer friendly service that has enabled us to carve a niche for ourselves across the length and breadth of India. Today, Karachi Bakery is a household name in every nook and corner of the globe.